Mad Man Earl Muntz made his start in lifein the mid 30's as a used car salesman in Illinois. In the early 40's, Muntz moved his operation to Glendale, California. This was the beginning of the most colorful, outrageously successful merchandising promotion in the history of used cars. Earl Muntz was in the right place (Los Angeles) at the right time (1941). During the war years, he became the biggest used car dealer in the world. 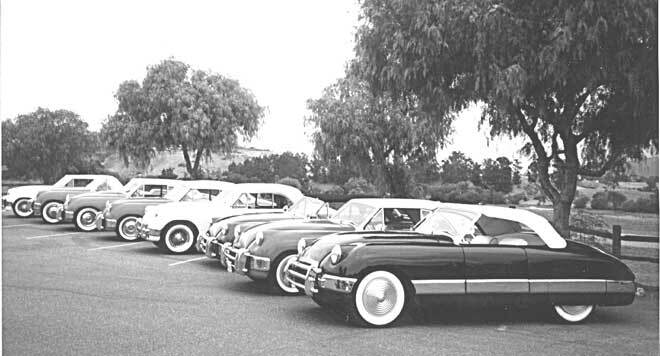 By 1947 Earl had continued in his command of the used car market, but had taken on the largest Kaiser-Frazer dealership in the U.S. In 1947 alone he sold $72,000,000 worth of new and used cars. Muntz sold 22,000 new K-F cars that year, which is really impressive when you stop to think, the total K-F output for 1947 was only 147,000. That's 1 in 7 cars! The "Madman" aspect of his personality gained nationwide attention when Earl hired a young advertising man by the name of Mike Shore. Shore started a flamboyant radio and billboard campaign in L.A. that has never been surpassed. Such quotes as "I WANT TO GIVE THEM AWAY, BUT MRS. MUNTZ WON'T LET ME.........SHE'S CRAAAZY!.......I BUY 'EM RETAIL, SELL 'EM WHOLESALE - MORE FUN THAT WAY!" ........... "" YOU TOO CAN BE A WEALTHY PEDESTRIAN!"........ "JUST SOUND YOUR HORN, WE PAY BY EAR!" An interesting sideline I learned when I met Earl in the 70's was that his real love was not even cars! Muntz was a hell of an inventor, and his true interests were with anything that had to do with electronics...hence the Muntz T.V. In the late 40's Muntz designed a set that was much simpler than his competitors. Since he sold millions of them cheaper, fortunes skyrocketed. Meanwhile, Muntz had a falling out with Henry Kaiser and decided to look into building a car of his own. In 1950 he answered an adv. on a Lincoln for sale by a man named Frank Kurtis. Frank was a leading builder of Indianapolis and dirt track race cars. What Muntz ended up buying was a very intersting sports car that Frank had been playing with for the past several years. Muntz was so inpressed the he ended up buying the tools, dies and assests of the Kurtis firm. Kurtis stayed on with the project and he and Sam Hanks redesigned the original car to make it more acceptable to a greater number of buyers. 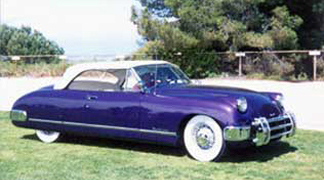 Muntz named his car the Muntz Road Jet. 1954 was not a good year for the Mad Man. His T.V. company had not prepared for the advent of color and was failing. He had also purportedly lost $1000 on every one of his Jets. He went into Chapter 11. Five years later, however, Muntz invented the 4-track tape player and went on to make yet a second million. All-in-all, Muntz made and lost 3 fortunes. He told me one time that he never minded losing a fortune, cause it was so damn much fun making the next! His later ventures included Muntz Motor Mansions, Muntz Motorcycle Park in Simi Valley, and of course Muntz big screen T.V.s. I can honestly say that I have never met any other person who was as dynamic as he was. Earl was really mesmerizing to be around because he loved life so much. Those of us who interacted with him, enthusiastically loved him as well. When Muntz purchased the assets of the Kurtis Company in 1950, he also got Frank Kurtis' genius in the deal. Muntz, Kurtis and race car driver Sam Hanks put their heads together to redesign the car to give it a broader base of appeal to the buying public. During this time 29 two-passenger cars were produced from aluminum. They were basically unchanged from the Cadillac powered Kurtises except for the gadgets Muntz added. 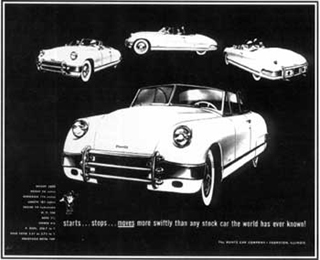 Muntz, along with Mike Shore, used their advertising genius to promote the car way beyond its prominence. A 1950 road test of the Muntz Jet published in Sports Cars magazine had this to say about the "Road Jet": "When we test-drove car #6 we used a stopwatch for the pickup figures. Example: 0 - 80 in 9 seconds. On the turnpike, 125 with something left in foot. The car rides well, corners well and stays on an even-keel. finish, is high-quality throughout and the instrument panel has everything by way of dials. After the initial 29 were built, the company moved to Evanston, Illinois where Muntz, Hanks and Kurtis unveiled their "new improved" model. They lengthened the car 13" to accept a rear seat, thus the first "sports car" which would seat 4. 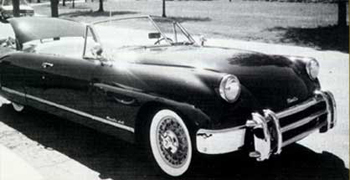 Because of typical General Motors arrogance towards small auto companies, Muntz was unable to sell his car with the Cadillac engine unless he disguised it. 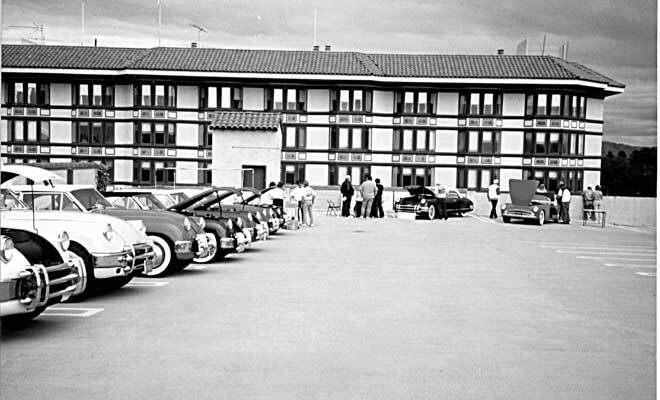 Luckily, Muntz had a special relationship with Benson Ford and was not only able to buy parts from Ford, but Ford also agreed to allow new Muntz cars to be serviced by local Ford Dealers. The revamped Muntz now came with a flathead Lincoln engine and "Lincomatic" transmission as well as Ford suspension, windows and many other items. Muntz might have had an in with Ford since he gave Ford a new Muntz! It was rumored that Ford got a lot of ideas from that Muntz for their upcoming sports car, the Thunderbird. Many of the other innovations Muntz placed on his car were unheard of in the American auto industry at that time. Each car was equipped with a padded dash board and seat belts (unfortunately affixed to the seat!). Survivors of the company say that, "The seat belts were strictly a gimmick, since if you were going to name a car a jet, you better have seat belts." Muntz had a few innovations of his own. He invented a console between the front seats and placed a Motorola radio in it. He actually affixed the speakers in both kick panels. Other options were as weird. Many cars came equipped with wire recorders (tape was not yet being used) or telephones. The weirdest option of all was, without a doubt, the liquor bars built into the huge rear armrests. One of the armrests is actually an ice box! Muntz, being a flamboyant character, attracted that type of clientele. Most of the cars he sold were to the Hollywood crowd. Each tried to outdo the other with a more outlandish Muntz than their friend's. The rare Muntz is one that is a sedate color and interior. Pink, heliotrope, chartreuse, purple and bright lemon yellow were accented with such interior fabrics as snake skin, emu, alligator, leopard and many others. The final absurdity came when a radio personality in Chicago who had a boat fetish, had Muntz "deck" over the back seat area with mahogany planks, just like his boat. The car was then finished in a bright chartreuse! Besides these decor items, many customers ordered their new cars with even hotter engines. Multiple carburation, aluminum heads, hot ignitions and 3/4 race cams were added as "soup up kits". Later cars were affixed with the new 317 cu. in. Lincoln overhead motor with the dual range Lincomatic (Hydromatic) transmission. These cars were incredibly fast. Unfortunately Muntz purported to have lost over $1000 on each car for a grand total loss of $400,000 during the car's four year stint. In late 1954, Muntz dismantled the entire manufacturing process and destroyed all the tools and dies. His claim of 394 vehicles produced has never been substantiated, but rather, 198 according to extensive serial number research. One count or another, it's a very low production. What is amazing is how well this vehicle is remembered. I guess we need to give the credit to Muntz, Shore and the car that makes you smile. 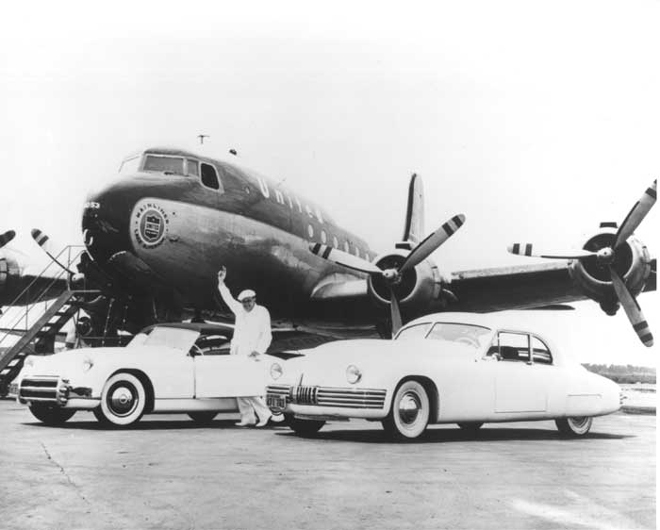 Earl Muntz standing next to his new Muntz Road Jet soon after acquisition of the the company froM Frank Kurtis. The car in the foreground was a Kurtis prottype made just after the war from a salvaged 1941 Buick.